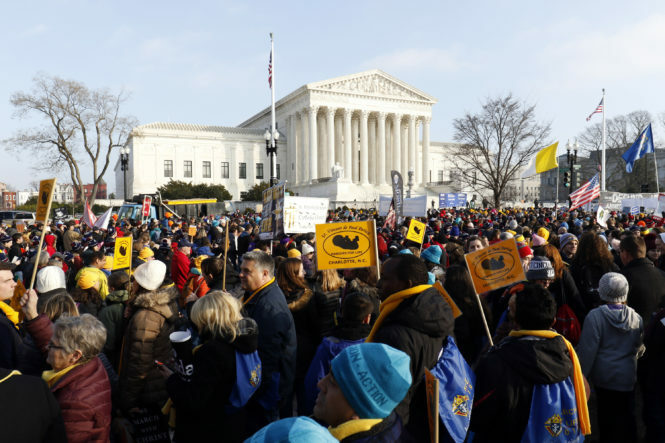 WASHINGTON (CNS) – The U.S. Supreme Court blocked a Louisiana law requiring abortion providers to have admitting privileges at nearby hospitals Feb. 7. In the court’s 5-4 vote, Chief Justice John Roberts sided with four justices in favor of blocking this regulation for now. Since the decision was a brief order, it did not contain an explanation. The court is likely to hear a challenge to the law’s constitutionality during its next term. Justices Clarence Thomas, Samuel Alito, Neil Gorsuch and Brett Kavanaugh sided with the state law, but Kavanaugh also wrote a dissent from the order, noting he would have preferred more information on the specific impact of the state’s restrictions. In his four-page dissent, he wrote that the main issue is whether the admitting-privileges requirement puts an “undue burden” on a woman’s ability to have an abortion. He pointed out that the lower courts have reached different conclusions about the admitting privileges for the three doctors who perform abortions at the state’s clinics. Kavanaugh said the state’s doctors and hospitals should first aim to resolve the admitting-privileges question and if they can’t, the case should return to court. If they do resolve this issue and the doctors continue to perform abortions, he said the law would not impose an undue burden. The court’s order was issued near 9:30 p.m., just hours before the law was to go into effect, after being placed temporarily on hold by the Supreme Court Feb. 1. Pro-life advocacy groups were displeased with the court’s order, as was the chairman of the U.S. Conference of Catholic Bishops’ Committee on Pro-Life Activities. “The fact that abortionists and their facilities cannot or will not meet basic health standards exposes the lie of their clever slogan that abortion is health care,” Archbishop Joseph F. Naumann of Kansas City, Kansas, said in a Feb. 8. statement. “The abortion industry’s objection to such a reasonable law, and this court’s decision to temporarily prevent it from going into effect, is further evidence of how abortion extremism actively works against the welfare of women,” he said. “For a movement that purports to advocate for women’s health, it is bizarre that the abortion industry opposes laws like this,” she added in a Feb. 8 statement. In defending its requirement for abortion providers – supported 2-1 by the U.S. Court of Appeals for the 5th Circuit – the state of Louisiana said its law would not have the impact that similar legislation would have had in Texas, mainly because there is no evidence that an abortion clinic would close in Louisiana as the result of the law. A Louisiana abortion provider, June Medical Services, which has objected to the law, appealed to the full 5th Circuit in mid-January to rehear the case, but the judges voted 9-6 against doing so. Now the group plans to appeal the decision to the Supreme Court, but while it does, it has asked the court to stop the law from being enforced. After the Supreme Court’s 2016 ruling that struck down required hospital admitting privileges, similar policies have been struck down or unenforced in Alabama, Mississippi, Oklahoma, Tennessee and Wisconsin. Currently, Missouri, North Dakota and Utah have such a law. Roberts, who was the swing vote in this order, voted to uphold the state’s law in the Texas case. By staying the Louisiana lower-court’s ruling, the Supreme Court has essentially set themselves up to give a full review of this case next term and its final decision could potentially differ from its Texas ruling with two different justices on the bench, Gorsuch and Kavanaugh, appointed by President Donald Trump.